Being at home with the kids during the Easter holidays has given them the chance to put their culinary skills to use again. I have mentioned before how much my kids love to cook, but what they also really love, is to see the process through right from the supermarket to the plate. Inspired by watching "Katy I Can Cook", this week, the kids have embarked upon making their own Vegetarian Sausage Kebabs using rosemary stalks as sticks - an idea they got from I Can Cook, which I was very impressed with. Eldest found some woody rosemary stalks at the supermarket and grabbed them, eager to make the vegetarian sausage kebabs. I then put her in charge of choosing the ingredients she needed to buy. Her and youngest chose what other vegetables they wanted to include on their kebabs, and had great fun weighing the vegetables and seeing how much they cost. Eldest is into adding up at the moment, so it was also a chance to help her add the ingredients together and make sense of how much they cost in pounds and pence. Back home, the kids got busy breaking up the peppers and chopping the tomatoes with their kids knives. I cooked the sausages and chopped up the onions, and eldest started to prepare the rosemary stalks whilst youngest ate lots of peppers, but still had a thoroughly enjoyable time! Then both girls got busy threading their ingredients onto the rosemary stalks to make their kebabs, and brushing them with honey. 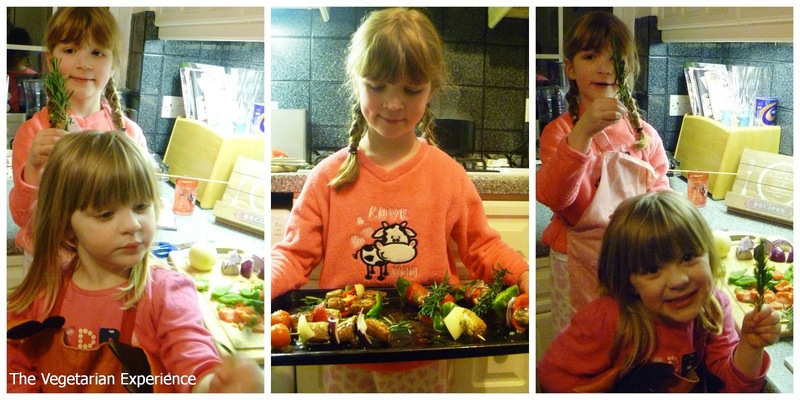 The girls had a lovely time making their vegetarian sausage kebabs, and it also encouraged them to eat something healthy to balance out all of the Easter chocolate they had consumed! I always find they will eat the things that they make themselves without question. These Vegetarian Sausage Kebabs are a fab idea for kids to make as they can make them virtually themselves. You could also use vegetarian chicken pieces, or just use vegetables and substitute the honey with a vegan alternative to make them vegan. 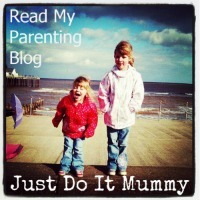 Why not let your kids have a go at cooking something themselves over the Easter Holidays? 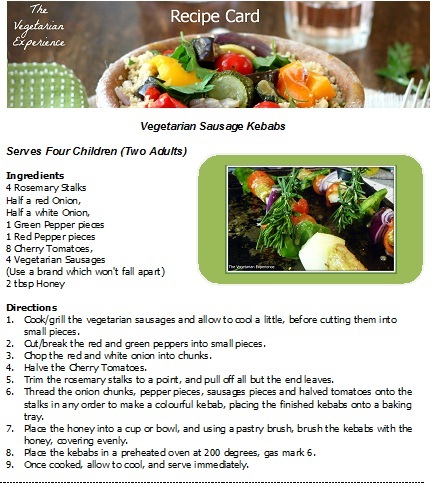 Let us know if you decide to make the Vegetarian Sausage Kebabs, the recipe can be printed out below. Cook/grill the vegetarian sausages and allow to cool a little, before cutting them into small pieces. Cut/break the red and green peppers into small pieces. Chop the red and white onion into chunks. Trim the rosemary stalks to a point, and pull off all but the end leaves. 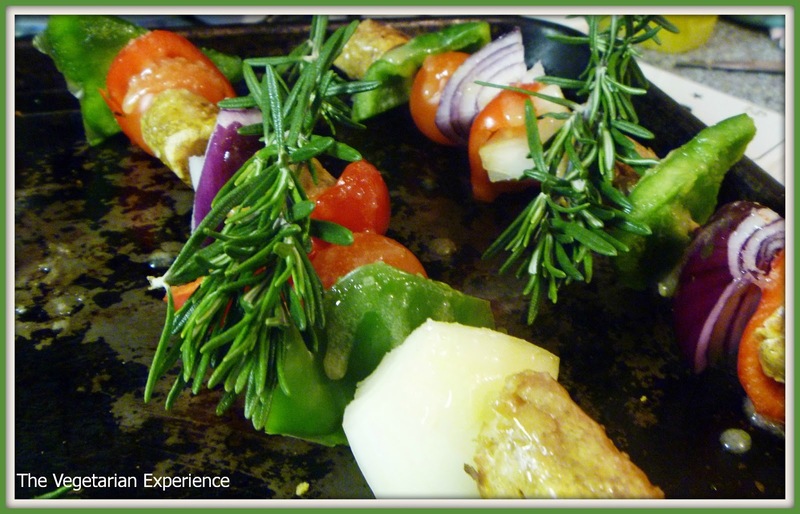 Thread the onion chunks, pepper pieces, sausages pieces and halved tomatoes onto the stalks in any order to make a colourful kebab, placing the finished kebabs onto a baking tray. Place the honey into a cup or bowl, and using a pastry brush, brush the kebabs with the honey, covering evenly. Place the kebabs in a preheated oven at 200 degrees, gas mark 6 for 20 minutes. Once cooked, allow to cool, and serve immediately.